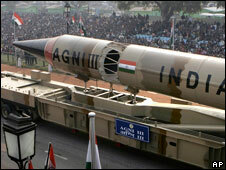 India's Agni missiles increase military reach and political instability in the Region. As India and Pakistan are always in trouble between each other India has lunched a missile capable to target some 2000 km ground to ground today. India has test-fired its intermediate-range nuclear-capable ballistic missile, Agni-II. The surface-to-surface missile was test-fired off an island in Orissa state in eastern India, officials say. With a range of more than 2,000km (1,250 miles), the missile can carry a nuclear payload of 1,000kg. The Agni series are among India’s most sophisticated missiles. A long range version was successfully test-fired last year. The Agni-III missile, tested last year, has a range of more than 3,000km (1,865 miles) and could hit targets as far off as Beijing and Shanghai, analysts say. The Agni-I has a range of 750km (470 miles). The Agni (literally “fire” in Hindi and Sanskrit) missile family is believed to be the mainstay of the Indian missile-based strategic nuclear deterrence. Based on some news sources Pakistan also planning to test a missile of same or higher capacity within a week or later. This regarded as compitition between two rival powers in South Asia. -Based on BBC News source.